This article addresses the relationship between technology and institutions and asks whether technology itself is an institution. 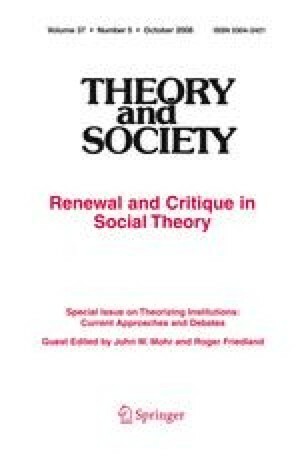 The argument is that social theorists need to attend better to materiality: the world of things and objects of which technical things form an important class. It criticizes the new institutionalism in sociology for its failure to sufficiently open up the black box of technology. Recent work in science and technology studies (S&TS) and in particular the sociology of technology is reviewed as another route into dealing with technology and materiality. The recent ideas in sociology of technology are exemplified with the author’s study of the development of the electronic music synthesizer. An earlier version of this article was presented at the 2003 UC Santa Barbara conference “Cultural Turn IV: Instituting and Institutions”. I am particularly grateful for detailed written comments from John Mohr and Thomas Gieryn.